ATTENTION: This item does not include a lens. The GY-HM790 utilizes three precisely aligned 1/3-inch progressive scan full HD CCDs—one each for red, green and blue primary color—and outputs full resolution in both 720p and 1080i/p. 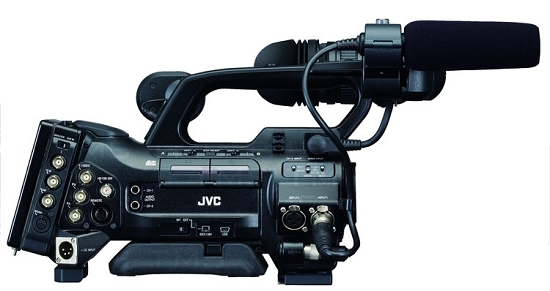 JVC's advanced ProHD capture technology incorporates a new patent-pending Adaptive Pixel Correlation Technique (APCT), and combined with TRIPLEX Offset Technology delivers exceptional resolving power comparable to cameras with larger image sensors. The highly efficient ProHD form of H-V pixel shift, where the Blue pixels' sensor array is shifted ½ pixel horizontally, while the Red pixels' sensor array is shifted ½ pixel vertically (both referenced to the Green array), enables recovery of additional luminance detail between the photosites of each pixel. By applying the Adaptive Pixel Correlation Technique, the camera achieves a remarkable improvement in image texture and resolving power in the 1080i/p modes. The TRIPLEX/APCT system differentiates between "object directions" in high frequency areas of the image, to the extent vertical, horizontal, diagonal (left) or diagonal (right), and then applies pixel compensation for lost pixels in high frequency areas. Furthermore, using a global shutter, the design minimizes wobbling during quick pans and fixed pattern noise in low light conditions, contributing to a more stable image.